PASTOR SONJA HAGANDER brings a deep passion for helping young adults explore Christian vocation and creating lives of faith and service. 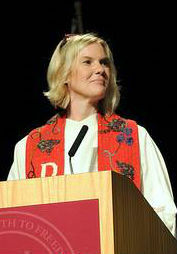 She has also led several interfaith initiatives at Augsburg, the ELCA’s most diverse college. In that context, she plans and leads worship each week in a challenging but very energizing urban multi-faith community. She has served as Pastor-Theologian at the Center of Theological Inquiry, Princeton University, and as Chaplain and emcee to the ELCA Youth Ministry Extravaganza Conference which hosts more than 1,000 pastors and youth leaders. She has been a contributor to “Word and World” and the ELCA e-zine for women, “BoldCafe.org.” She lives in the Twin Cities with her family. They love all things water: paddleboarding, skiing, canoeing, swimming, sailing, and kayaking.